Regardless of what motivation makes us start to meditate, meditation itself becomes a practice and process of letting go. To emphasize this, the great Japanese Zen master Kodo Sawaki Roshi often proclaimed that Zen meditation is "good for nothing". Sawaki took issue not with Zen meditation (he kept sitting for many hours every day), but rather with people's expectations of personal gain. Zen meditation, otherwise known as Zazen, can also be called "just sitting". This makes for a very practical and uncomplicated approach. Basically you sit down and start with where you are, and also end with where you are. Along the way, you sit straight and just stay aware of whatever you are experiencing - without getting caught up in thinking about it or trying to change it. Essentially Zen meditation is not about trying to create calmness or stillness (or any experience), so much as about practicing non-judgmental awareness. In applying non-judgmental awareness to whatever we are experiencing, we are effectively "letting go", and calmness and stillness eventually set in as side effects. Sounds simple? Well, it is. Meditation is one of the simplest ways to be. But it has become burdened by our ideas and expectations regarding its benefits. This means that many new meditators tend to start by trying too hard (in an effort to achieve something), but then quickly give up because it seems too hard (when the experience does not match the expectations). 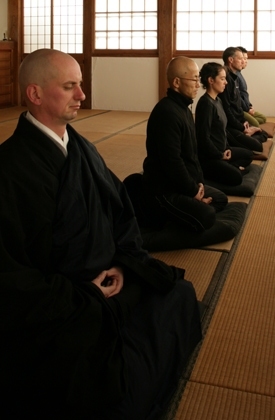 Actually Zazen is as simple as "just sitting", and as ordinary as brushing teeth. Most of us brush our teeth with reasonable regularity and discipline, yet without much fuss or instant expectations. Just like tooth-brushing, Zen meditation is a matter of regular habit much more than of any skill or technique. Meditation is a choice and certainly not a forced activity. If you choose to take up Zen meditation, there is no question that you will be perfectly capable of it. The issue is not so much whether you will "succeed" in meditating, but rather whether you may be willing to accept your meditation experience just as it is. Accepting it just as it is whilst staying with it can also be described as "mindfulness" (an very popular term these days, though unfortunately often mistaken for being just more self-conscious in a selective way). Being one with your meditation is simply to be one with your present experience. Being one with your present experience is to become one with yourself. And being one with yourself is actually to begin to lose track of who you are (especially in terms of our thinking mind). Whatever benefits may arise from meditating, they are likely to come not from trying to control or change something, but from sitting wholeheartedly and letting go - here and now. Sawaki Roshi: "Hey what are you gawking at? Don't you see its about you!"